Torque is a budding local mobile phone brand that offers very affordable handsets. It is quite similar to Cherry Mobile and MyPhone which both offer super-cheap mobile phones. Torque claims to have the first dual-SIM Android phones in the market. Considering that I am currently not aware of any other Android phone with dual-SIM capabilities, I believe in what Torque is claiming. 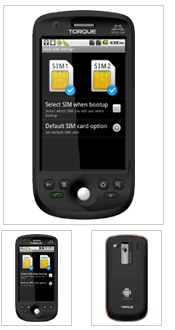 Being offered on introductory sale very soon are two Torque dual-SIM phones named Droidz Tandem and Droidz Dual. The sale is happening on two announced dates: April 16-17, 2011. The phones’ features are pretty impressive, although it remains to be seen if they will withstand heavy use. Torque offers 12-month warranties on these handsets but I am not aware how the company is in terms of after-sales support. Here are the features of the two Android phones included in the introductory sale. 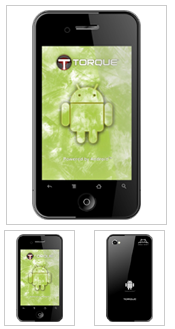 The Droidz Tandem looks eerily like an iPhone. Just saying. wala bang mas mura na android ?? sana po meron na rin yan d2 sa saudi para makabili rin ng gawang Pilipino, taas noo po kaming supportahan ang Torque mobile na sariling atin. I WANNA TRY TORQUE BRAND..KNOWING THAT IT WAS CREATED BY A PILIPINO,SAW HIS INTERVIEW WITH KORINA SANCHEZ..LAST SUNDAY…GO..PINOY!! wla bang patawad sa price? baka naman may nakabili? maganda ba quality nya? does anyone knows how to access the calendar without creating a google account? gudafternun po.. maari ko bang malaman kung kailan ang next na labas ng android phone ng torque..? kase po di o ma search ng mabuti ang site po nya.. thanks and godbless po..
they have new android phones. try to visit their website. are these the only droid phones torque has? what’s their site btw? 412 Mhz lang daw CPU nito..check niyo sa FB page ng torque..May nagtanong dun..Wala pa GPS..As per Torque battery life ranges from 1 to 2 days depending on the usage..
mababa. mas mabilis pa ang HTC wildfire at LG optimus one. HTC Wildfire is more expensive than those kaya dapat mas mabilis ang wildfire. mahal!!! ang baba pa ng internal memory at ram. iPhone designs over and over again. You can get these 2 cheaper if you don’t care about the warranty XD The site also offers free shipping worldwide..
Wow they’re cheaper. Although because they are substandard maybe warranty is important. There is after sales available here in philippines, located at Chino roces la fuerza plaza room 415, don’t worry bout the after sales support i will assuring that torque are always taking care there client need. can this android be updated to the latest version if updates are available? There’s no telling. Considering that these are local releases, and probably without customization, updates may not be offered. You may be right. These phones appear to be China-made. The screen resolution might have been sacrificed to make these cheap. haha. you may be right. medyo secretive itong torque pagdating sa CPU specs. it’s not in the specs list which can be seen from their site.